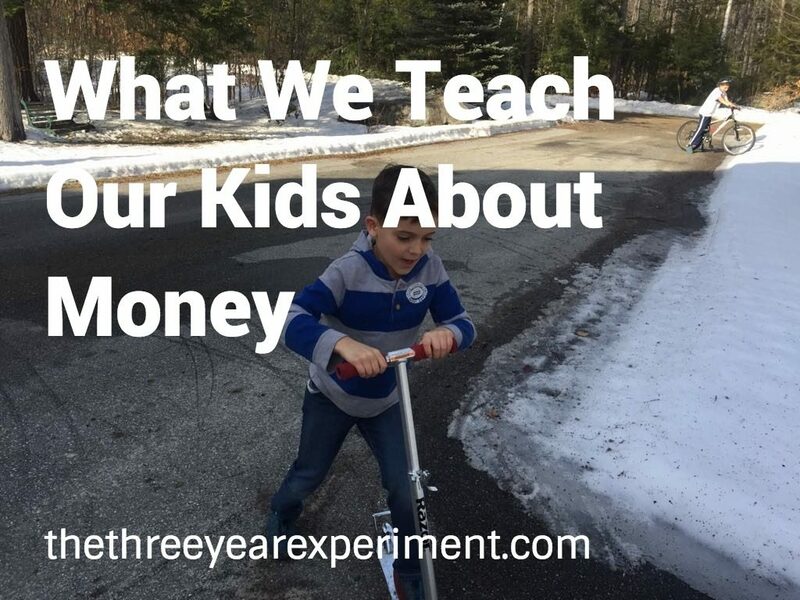 Last week, I published a post that talked about the things we do to teach our kids about money. 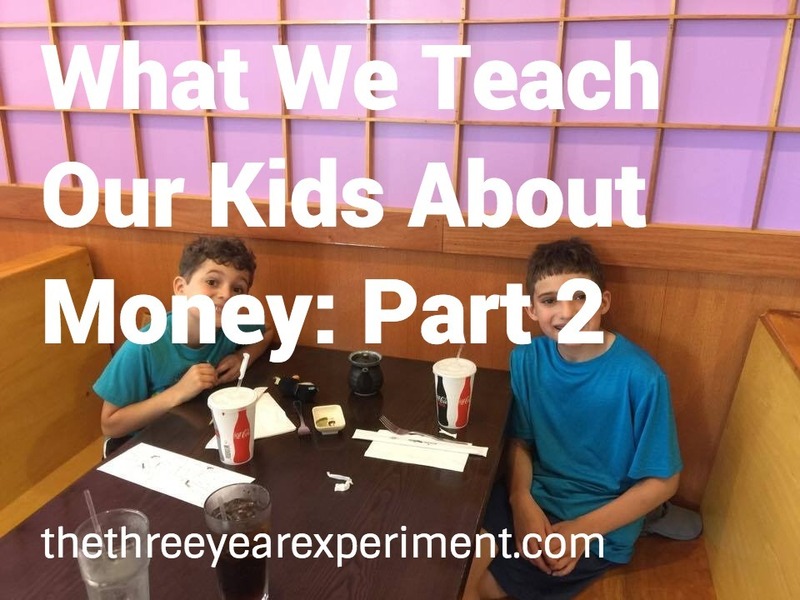 Since it turns out that we actually do quite a lot of things to teach them financial literacy, today is Part 2 of What We Teach Our Kids About Money. If you missed Part 1, read it here! We were given an old kids’ toy book from Chick-Fil-A many moons ago, called The Super Red Racer: Junior Discovers Work. Turns out, it was from a Dave Ramsey series of books for kids that taught about different financial topics like saving, giving, and investing. Junior ThreeYear loved the book so much that we eventually bought him the whole series for Christmas one year. Parenthood is a big responsibility and I feel like I’m messing it up a dozen times a day. When it comes to teaching our kids about how to manage their money, though, I feel like we really need to get it right. Mr. ThreeYear and I got out of debt by following Dave Ramsey’s baby steps, and we also listened to what he had to say about kids and money. He has a lot of great advice when it comes to teaching your children about financial matters, so we started there. But money is such a complex and important topic that we certainly didn’t end there. Here’s what we currently do to make sure that our kids have a good relationship with their money. Have you ever made a change in your life–maybe a huge one, like getting out of debt, or maybe a small one, like deciding not to buy takeout coffee–that in turn, caused benefits that you never imagined? Maybe getting out of debt made you realize that your house was too big, so you decided to move into something smaller. Maybe not buying takeout coffee helped you realize you could save in other small areas, and after a few months, you ended up with enough to go on a trip to Florida. 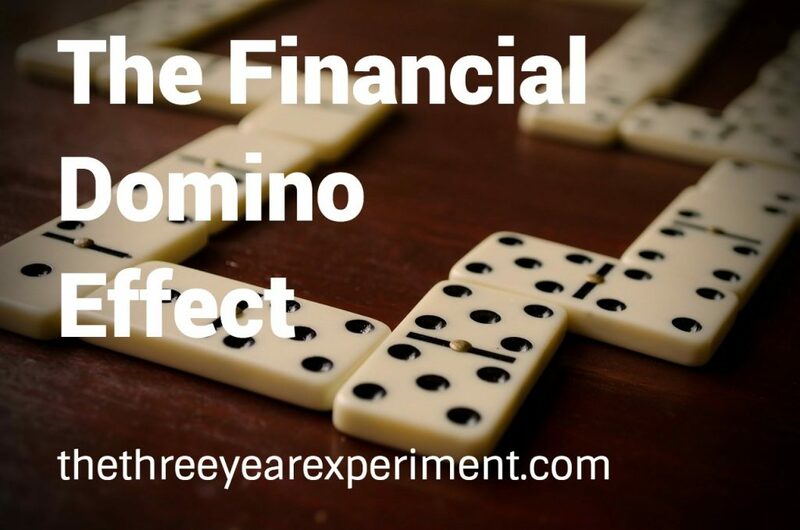 This is the financial domino effect, and it happened to me. Like a chain of dominoes, where one tile makes the whole line fall down, one seemingly small change in your life creates scenarios that make it more likely you’ll create other small changes. Happy Valentine’s Day. And Happy Ash Wednesday (aka the first day of Lent). 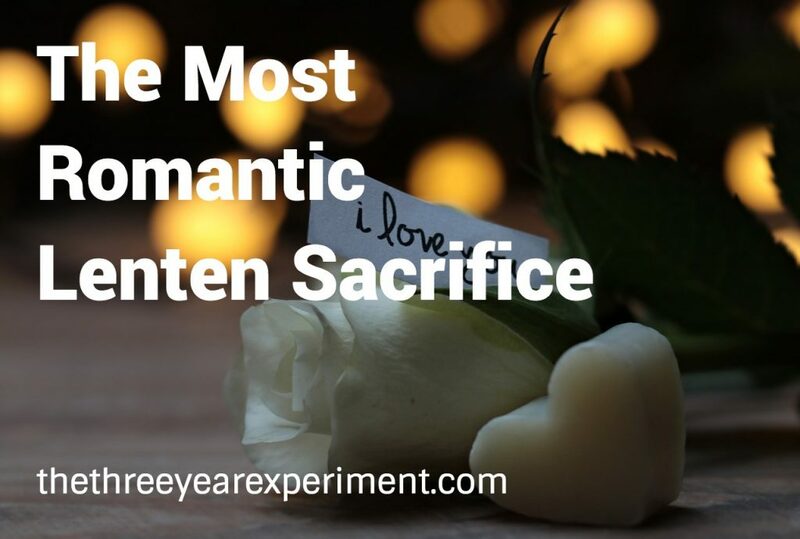 It’s the first time since 1945 that Valentine’s and the start of Lent have fallen on the same day. So in honor of such an auspicious occasion, I’m taking on a new challenge. While Valentine’s is usually about eating as many chocolates as you can get your hands on, Lent, at least for those in the Christian tradition, is a 40-day time of inner focus, of taking a look at yourself and seeing if there’s anything that you could improve upon. It’s traditionally a time when practitioners make a sacrifice, give up a vice, or adopt a new, perhaps self-sacrificial habit for 40 days. Life Is Short. So Why Not Buy What You Want? Life is short. Do not forget about the most important things in our life, living for other people and doing good for them. Life is short. I was reminded of that yesterday when I heard the news that yet another friend’s sister entered Hospice. I’ll spare you the details, because it’s a heart wrenching story. They all are. It wasn’t that long ago that I hugged my friend Pam, both of us sobbing, as we absorbed the news that her sister had three days to live. Life is short. Eff it. Buy the car, I hear people say. Sometimes death feels like it’s all around, especially with the advent of social media. I’ve watched more distant friends, their spouses and children, suffer cancer, car accidents, the loss of babies. I’ve watched the intimate details of people I was sort-of close to once upon a time live unimaginable, heart-wrenching things. It’s gotten so bad at times that I’ve had to step away from social media and shut it all out. The worst part of so much heartache is that it reminds you that it could happen to you, that you or one of your people could get sick, get in an accident. Reminds you that you, too, are vencible, as Junior ThreeYear likes to say (“That should be a word, right, Mom?”). 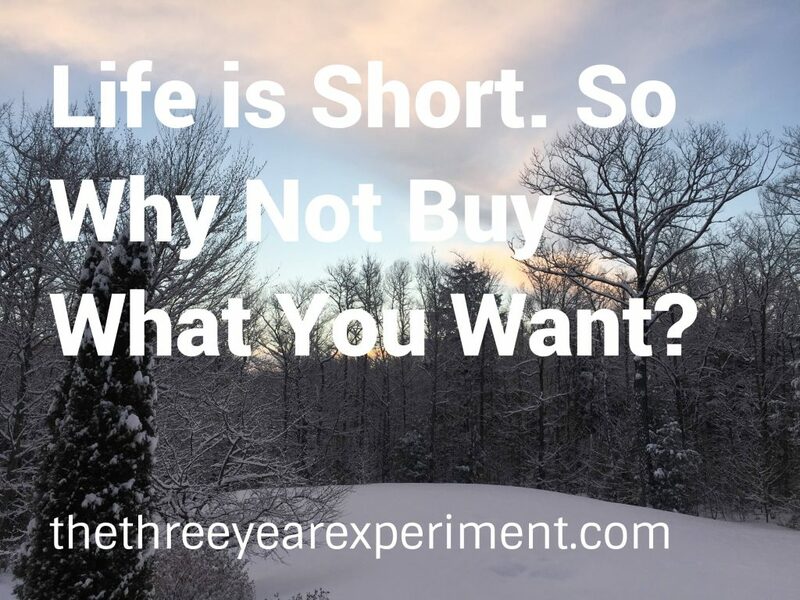 Author LauriePosted on February 12, 2018 February 15, 2019 Categories Money Management, Simple LivingTags buy the stuff, frugal, life is short, saving for the future, spending39 Comments on Life Is Short. So Why Not Buy What You Want? 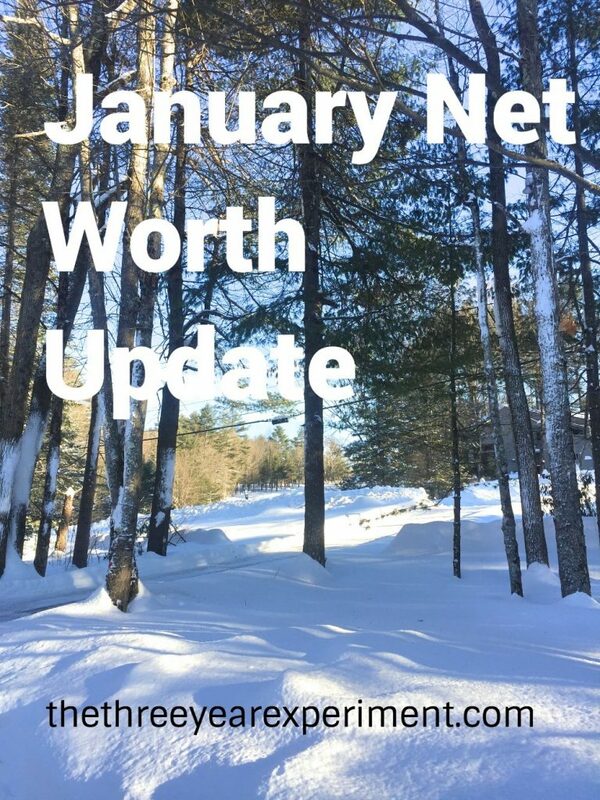 It’s time for another net worth update! Are you in the midst of winter, or is it warm and deliciously summery where you live? The ThreeYears are smack dab in the middle of the coldest and snowiest parts of winter, but we made it through January and we’re raring to go for February (Little ThreeYear can hardly wait for Valentine’s Day and all that chocolate he thinks he’ll get from his classmates!). This is the first report from 2018, and boy is it a good one. Subsequent reports may not be as juicy, given that the stock market may have more “small or significant corrections” coming up, so I’m focusing on January while I can! If you’re just joining, our family of four is on a three-year journey to double our net worth and become location independent. Each month, I record our progress on our net worth and our spending (gulp!). Last year, we increased our net worth by 32% over the year before! This year, we’re trying to increase it by more than 65%! from where we started in December 2016. Given the wild ride the market’s likely to take us on this year, I’m not sure it’s doable. But we’re going to try! We started the month of January off in warm Santiago. We took a three week trip to visit my in-laws, and had an amazing time. 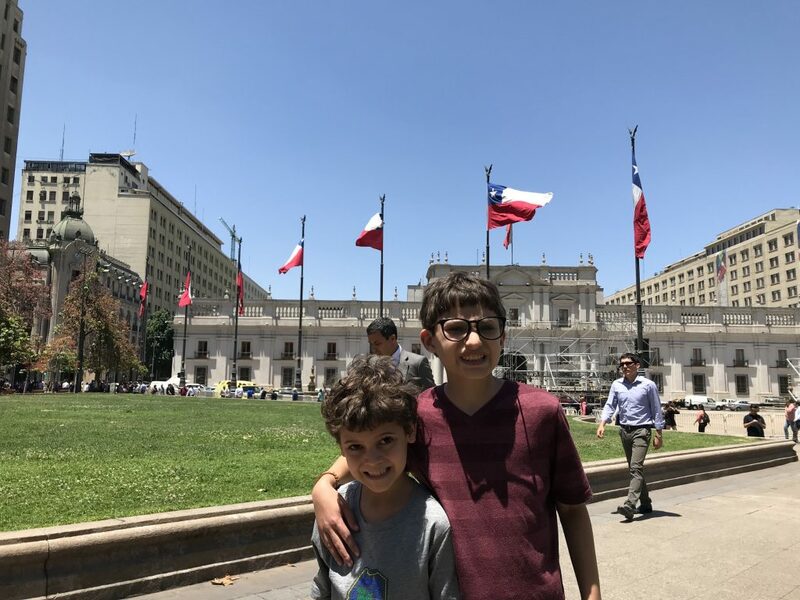 The boys had a blast during our visit to Santiago and San Pedro de Atacama in Chile, even if some of the smiles look forced! I was very excited to see how our spending would look in January as compared to spending in 2017, given we have now eliminated the mortgage in Chile and our car payment. We’re also working to keep our food spending lower than last year. Hi all! 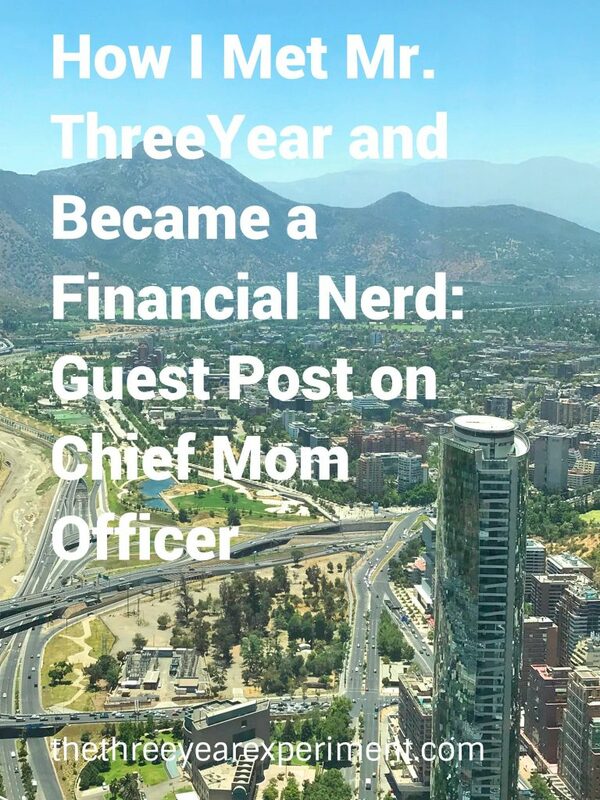 Today, I’m really excited to have a guest post over on Chief Mom Officer’s awesome site on how Mr. ThreeYear and I met and how I became the financial nerd I am today. Liz, AKA Chief Mom Officer, and I have been “blog friends” for almost as long as I’ve been blogging, and we’re now IRL friends, too, since we got the chance to meet in person in Boston last fall. 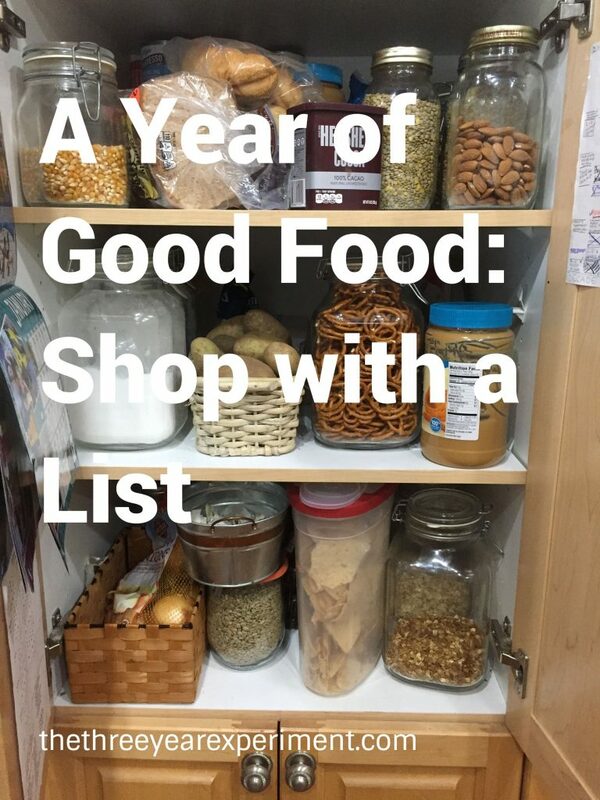 It is time to report on our first month’s progress in the A Year of Good Food Challenge. This year, our family is challenging ourselves to spend less on food, so we can reach our goal of location independence in two more years. Last year, I challenged myself to adopt one habit a month that would translate into better money moves for our family. You can read all about what I called A Year of Good Habits here. Year Two’s Challenge is called A Year of Good Food. This year, we are challenging ourselves to do better at our food spending. Our family spent an average of $966 US per month on groceries in 2017 for our family of four. That’s almost $12,000 in just groceries last year. This year, we’ve adopted the (what we hope is attainable!) goal of shaving 20% off that number, each and every month. That means we would spend no more than $772 in groceries in any month of the year.